356 in stock Need More ? The journey from strategy to operating success depends on creating an organization that can deliver the chosen strategy. 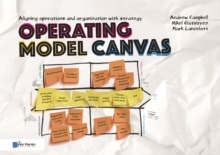 This book, explaining the Operating Model Canvas, shows you how to do this. It teaches you how to define the main work processes, choose an organization structure, develop a high-level blueprint of the IT systems, decide where to locate and how to lay out floor plans, set up relationships with suppliers and design a management system and scorecard with which to run the new organization. The Operating Model Canvas helps you to create a target operating model aligned to your strategy. The book contains more than 20 examples ranging from large multi-nationals to government departments to small charities and from an operating model for a business to an operating model for a department of five people. The book describes more than 15 tools, including new tools such as the value chain map, the organization model and the high-level IT blueprint. Most importantly, the book contains two fully worked examples showing how the tools can be used to develop a new operating model.